In 2018, the export turnover of garments and textiles was $36.2 billion and ranked 4th among Vietnam’s largest export industries. It is ­estimated that the figure will increase to $50 billion by 2025. 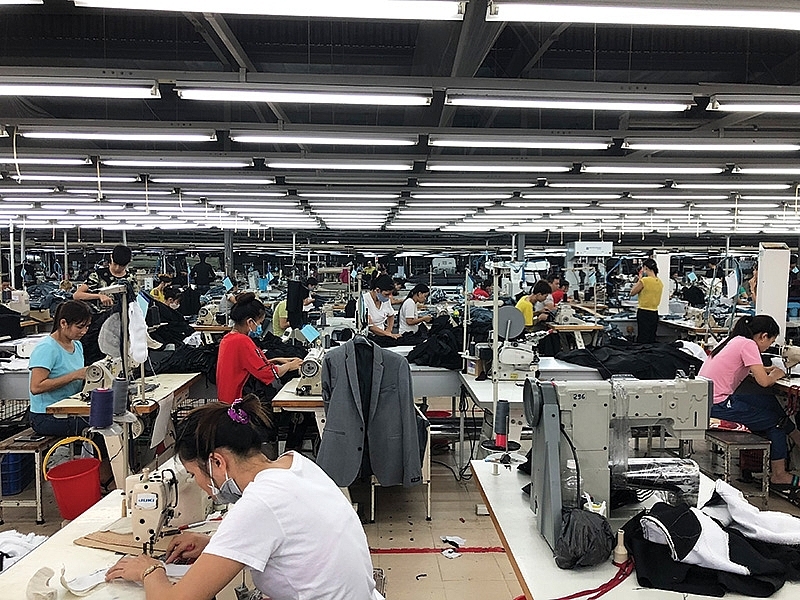 Last year, Japan and Canada were among Vietnam’s top export markets of garments and textiles with respective values of $398.2 million and nearly $70 million. Meanwhile, Vietnam’s footwear and handbag industry was listed among the country’s biggest exports, with the turnover of $19.5 billion last year. The country ranked second in the world in terms of exporting footwear. The Vietnam Leather, Footwear and ­Handbag Association forecasts that turnover will reach $22 billion this year, up 10 per cent compared to 2018, and ­accounting for around 9 per cent of the country’s export turnover. According to data by the General Statistics Office of Vietnam, Japan, Canada, and Mexico were the three among largest export markets of Vietnam’s footwear in January 2019, with respective values of $126 million, $32.9 million and $31.5 million. On January 14 the Comprehensive and Progressive Agreement for Trans-Pacific Partnership (CPTPP) officially took ­effect in Vietnam. The deal will witness the extensive reduction of import tariffs for textiles, garments, and footwear products, whose many types of materials can be ­similar. With the CPTPP, 78 per cent of Vietnam’s footwear products exported to a number of CPTPP markets will enjoy a zero per cent tax rate or enjoy a 75 per cent cut ­compared to the previous rate. Imported tax for leather shoes, for the first time, will be gradually reduced and eliminated in the 16th year after the agreement comes into effect. This type of tax for footwear into Mexico and Peru has also been steadily reduced and will also be ­removed on the same timescale, leading to strong opportunities for ­Vietnamese businesses to seize. Apparel encompasses one full chapter in the CPTPP, with both general and specific ­regulations. Contents of ­commitments on textiles and garments include the specific rule of origin (ROO) which ­requires using yarn and fabric from the CPTPP bloc to ­promote internal supply and ­investment chains, in order to ­increase the value of textiles produced in the bloc. There are also flexible ­regulations on the mechanism of supply shortages, allowing the use of certain fibres and ­fabrics currently unavailable in the region. Accordingly, for textiles, the ROO is set in stages: the entire process of spinning, weaving, dyeing, ­finishing, and sewing must be carried out ­inside the bloc. According to Hoang Van Cuong, vice ­rector of the ­National ­Economics University, the challenging condition in the CPTPP agreement is on the regional value content of apparel products. Although this rule encourages development of the vertical textile supply chain, spurs investment in yarns and ­fabrics, and creates opportunities for Vietnamese firms to participate more deeply within the CPTPP, it ­remains an obstacle while most of Vietnam’s raw materials for this sector are imported from countries outside the member states. “Raw materials in the ­textile and garment industry are mostly ­imported from ­outside of the bloc so regarding the ROO, there will be many finished products which cannot apply these rules,” Cuong said. With the CPTPP, 55 per cent of raw materials must be produced inside the bloc and businesses can import a ­maximum of 45 per cent ­materials from outside to make a finished product. Therefore, raw materials need to be ­manufactured ­locally or ­imported from CPTPP ­countries instead of other ­countries, according to Cuong. Vu Duc Giang, chairman of the Vietnam Textile and ­Apparel Association (VITAS), ­also considered the ROO ­requirement a difficulty for Vietnamese enterprises. “Vietnam is an agricultural country. However, ­cotton is not planted on a large scale for industrial development. Thus, we have to ­import almost all cotton and 60 per cent of yarn and fibre,” Giang said. Trade negotiation expert Bui Kim Thuy said allowance of importing raw materials from countries inside the bloc shows the flexibility of the CPTPP in comparison with other free trade agreements. “Even with only 1 per cent of materials being of CPTPP origin, this ­percentage will be added up so that the product can ­benefit as part of the certificate of origin (C/O) incentives,” Thuy said. With the CPTPP, ­businesses can issue C/O by themselves instead of taking four hours to three days for the administrative work like ­before. However, Thuy also thought that to make the best use of the CPTPP, domestic ­companies must build their own supply chains and invest in sustainable ­development. Recognising great opportunities, including the ROO, from the agreement, ­international investors have been pouring capital into ­expanding and investing in the apparel and footwear sectors in Vietnam. With 24 years already racked up in Vietnam, South Korean footwear company Changshin has lured about 32,000 Vietnamese workers to its two factories. A few weeks ago, the firm inaugurated a 14.3 hectare, $100 million new factory in Tan Phu Industrial Park on an area of 14.3 hectares in the southern province of Dong Nai, with ­the capacity of 27 million pairs of shoes per year. Another investor from South Korea is Kyung Bang Vietnam. With the aim of ­becoming one of the leading high quality yarn factories in Asia and making use of the ­opportunities from the CPTPP, the company has recently been licensed for its expanding ­project in the southern province of Binh Duong. ­Accordingly, the investment was increased by $40 million, with the factory helping Kyung Bang Vietnam raise annual ­capacity to 9,000 tonnes of ­cotton yarn and 11,000 tonnes of blended yarn. The additional investment has increased the total registered capital of Kyung Bang Vietnam to more than $219 million. Earlier in January, a ­Chinese investor was awarded an investment certificate for the Huanyu textile dyeing ­factory project, with the total registered investment capital of $60 million in the southeastern province of Tay Ninh. In addition, a range of ­projects in apparel and footwear were announced last year by investors from ­Germany and the United States, such as the Amann Group sewing thread venture for the manufacture of apparel and shoes; or the Kraig Biocraft Laboratories Inc., the venture on expanding mulberry production and developing high-quality silk in the country. When the Trans-Pacific Partnership, the original ­version of the current CPTPP, was taking shape in previous years, many foreign investors ­entered Vietnam to get the deal’s benefits, especially the ROO. For example, having been investing in Vietnam since 2006 with six fibre factories in the northern province of Quang Ninh and the southern province of Dong Nai, Hong Kong’s Texhong Group in 2016 began construction of another $300 million fibre factory in Quang Ninh. Today, Texhong has become the biggest fibre producer in Vietnam. Besides, Pou Chen Group, a Taiwanese footwear ­company producing products for big brand names like Nike and Adidas, currently has dozens subsidiary companies manufacturing footwear and handbags in Vietnam, with ­export revenue of $1.5 billion last year. Currently, the company has recruited thousands of workers to widen its ­production. Furthermore are projects from Japanese investors, ­including Itochu’s purchase of an additional 10 per cent stake in Vietnamese state-owned ­textile and garment conglomerate Vinatex. This brought its ownership to ­approximately 15 per cent, becoming Vinatex’s second-largest shareholder behind the Ministry of Industry and Trade. Statistics from the VITAS showed that currently, Vietnam has attracted more than 2,000 foreign-invested textile and garment projects registered at over $17 ­billion. Meanwhile, according to the Vietnam Leather, Footwear, Handbag Association, Vietnam currently has about 1,200 ­foreign-invested footwear enterprises, which earned $13.97 billion in export revenue, holding 79 per cent of Vietnam’s total footwear export turnover.